Article 12 of Regulation (EC) No 881/2004 of the European Parliament and of the Council (2) requires that the European Rail Agency (hereinafter ‘the Agency’) shall ensure that the technical specifications for interoperability (hereinafter referred to as ‘TSIs’) are adapted to technical progress and market trends and to the social requirements and propose to the Commission the amendments to the TSIs which it considers necessary. By Decision C(2007)3371 of 13 July 2007, the Commission gave a framework mandate to the Agency to perform certain activities under Council Directive 96/48/EC of 23 July 1996 on the interoperability of the trans-European high-speed rail system (3) and Directive 2001/16/EC of the European Parliament and of the Council of 19 March 2001 on the interoperability of the trans-European conventional rail system (4). Under the terms of this framework mandate, the Agency was requested to perform the limited revision of the conventional rail TSI on Rolling stock – Noise (hereinafter ‘TSI Noise’), adopted by Commission Decision 2006/66/EC (5). A reference track whose use is mandatory under TSI Noise is not available in every Member State, and the Member States cannot be obliged to create one. This has prevented the development of a level playing field for all actors in the European Union and has created the financial burden which is higher than foreseen in the original Decision. Numerous problems regarding the availability of reference track, the test methods and the test costs have been signalled to the Commission and to the Agency. With the present Decision the Commission intends to clarify responsibilities with regard to the reference track, allow testing on non-reference track while assuring a proper collection and recording of comparable data for a future TSI revision, reduce the burden of proof compliance for small batches of vehicles and include the latest developments with regard to ISO EN 3095 standard. The noise limits and the scope will remain unchanged. This Decision therefore constitutes only a limited revision of TSI Noise and does not compromise a full revision of TSI Noise as provided in Section 7 of the TSI. For the sake of clarity and simplicity, it is better to replace Decision 2006/66/EC as a whole. Decision 2006/66/EC should therefore be repealed. 1. The revised version of the Technical Specification for Interoperability (hereinafter referred to as ‘the TSI’) relating to subsystem ‘rolling stock – noise’ of the trans-European conventional rail system referred to in Article 6(1) of Directive 2008/57/EC, as set out in the Annex, is adopted. 2. The TSI shall apply to the rolling stock of the trans-European conventional rail system as defined in Annex I to Directive 2008/57/EC. It shall apply to new and existing rolling stock as set out in Section 7 of the Annex. Where agreements contain requirement relating to noise emission limits, Member States shall notify them to the Commission within 6 months of the entry into force of this Decision, provided they were not already notified under Decision 2006/66/EC. The procedures for assessment of conformity, suitability for use and EC verification set out in Section 6 of the Annex to this Decision shall be based on the modules defined in Commission Decision 2010/713/EU (6). The Commission shall prepare the review and update of this TSI and make appropriate recommendations to the Committee referred to in Article 29 of Directive 2008/57/EC (‘RIS Committee’) in order to take account of developments in technology or social requirements, in accordance with the procedure set out in point 7.2 of the Annex to this Decision. Decision 2006/66/EC is repealed. Its provisions shall however continue to apply in relation to the maintenance of projects authorised in accordance with the TSI annexed to that Decision and, unless the applicant requests to apply this Decision, to projects for a new vehicle and for the renewal or upgrading of an existing vehicle which are at an advanced stage of development or the subject of a contract in course of performance at the date of notification of the present Decision. Done at Brussels, 4 April 2011. (2) OJ L 220, 21.6.2004, p. 3. (5) OJ L 37, 8.2.2006, p. 1. Noise emitted by locomotives, multiple units, coaches and OTMs. This TSI concerns the conventional rail rolling stock subsystem as defined in Annex II to Directive 2008/57/EC. Further information on the rolling stock subsystem is provided in Section 2. This TSI covers noise emitted by rolling stock in the scope of this TSI. The geographical scope of this TSI is the trans-European conventional rail system as described in Annex I to Directive 2008/57/EC. This TSI does not contain specifications related to interoperability constituents. In accordance with Article 5(5), provision may be made for specific cases for each TSI; these are indicated in Section 7. The rolling stock that is the subject of this TSI comprises the units defined in this clause which are likely to travel on all or part of the trans-European conventional rail network. The present TSI includes limits for stationary noise, starting noise, pass-by noise and driver’s cab interior noise. This type of unit includes any passenger train, consisting of one or more vehicles, in fixed or pre-defined formation. Thermal or electric traction equipment is installed in some (or all) vehicles of the train, and the train is fitted with at least one driver’s cab. This type is further referred to as multiple units. Examples of multiple units: trainset, electric and/or diesel multiple unit, railcar. This type of unit includes traction vehicles that are not capable of carrying a payload, such as thermal or electric locomotives or power heads. These vehicles are intended for freight or/and passenger transport. This type is further referred to as locomotives. Examples of locomotives: locomotive, shunter, power head, power car. This type of unit includes non-traction vehicles carrying passengers and/or luggage and operated in a variable formation with vehicles from the category ‘thermal or electric traction units’ defined above to provide the traction function. This type is further referred to as coaches. Examples of coaches: coach, driving coach, van, driving trailer and car carriers when intended to be used in passenger trains. This type of unit includes non-traction vehicles intended to carry freight and not intended to accommodate human beings during operation. This type is further referred to as freight wagons, or wagons. it is in transport (running) configuration on its own rail wheels, self-propelled or hauled. Working configuration is outside the scope of this TSI. This type of unit is further referred to as OTMs. OTM units shall meet the requirements as set out for locomotives in this TSI. The fulfilment of relevant essential requirements listed in Section 3 of this TSI shall be ensured by the compliance with the specifications set out in Section 4 for the subsystem, as demonstrated by a positive result of the assessment of the verification of the subsystem, as set out in Section 6. Operation of the trans-European conventional rail system must respect existing regulations on noise pollution in accordance with the essential requirement in point 1.4.4 of Annex III to Directive 2008/57/EC. Interior noise of locomotives, multiple units and driving trailers (basic parameter in point 4.2.3). The trans-European conventional rail system, to which Directive 2008/57/EC applies and of which the rolling stock subsystem is a part, is an integrated system whose consistency shall be verified. This consistency shall be checked in particular with regard to the specifications of the subsystem, its interfaces in relation to the system into which it is integrated, as well as the operating and maintenance rules. Taking account of all the applicable essential requirements, the rolling stock subsystem regarding Noise emitted by rolling stock is described in this section. This TSI is applicable to new vehicles, and renewed or upgraded rolling stock if required by the provisions of Section 7. Appendix G provides general information and definitions related to noise testing. When not described in this TSI the relevant EN standards shall be used with regards to terms, definitions, instrumentation and calibration, quality of the measurements, test report requirements and other general information related to the noise testing. The rolling noise itself is caused by the combined wheel and rail acoustic roughness and by the dynamic behaviour of the track and wheel-set. Stationary noise of a freight wagon will only be of relevance if the wagon is equipped with auxiliary devices like engines, generators, cooling systems. The indicator for pass-by noise is the A-weighted equivalent continuous sound pressure level LpAeq, Tp measured over the pass-by time at a distance of 7,5 m from the centre of the track, 1,2 m above top of rail. Measurements shall be made in accordance with Appendix E.
The measured pass-by noise levels shall comply with the values as set out in table 1 when measured on track complying with Appendix A. It is permitted to carry out the test on track that does not comply with Appendix A and if the noise levels do not exceed the values shown in table 1, there is a presumption of conformity to this requirement. the track acoustic roughness in accordance with EN 15610. If the track on which the measurements were performed did meet the reference conditions as set out in Appendix A, or if the acceptance criterion of Appendix B is met, the measured values shall be marked ‘comparable’. Otherwise the measured values shall be marked ‘non-comparable’. An entry shall be recorded in the technical file and in the ERATV if the measured values are ‘comparable’ or ‘non-comparable’. Measured values of noise, as well as corresponding track quality shall be saved in the technical file for later evaluation of correspondence between vehicle and track noise for both comparable and non-comparable data. 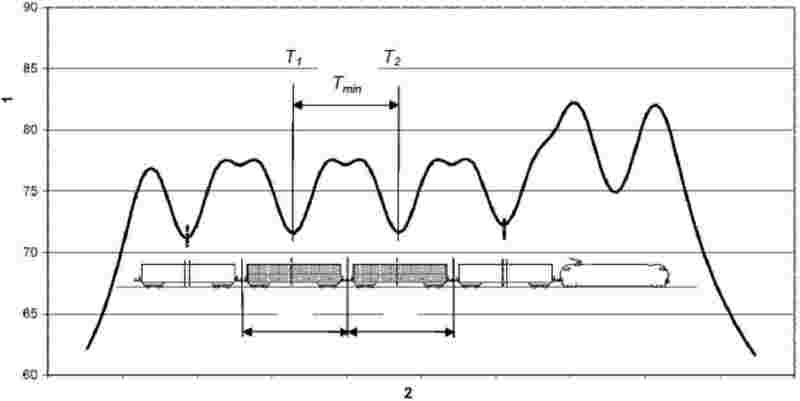 The measured acoustic rail roughness shall remain valid during a period starting 3 months before the measurement and ending 3 months after the measurement, provided that during this period no track maintenance has been performed which influences the rail acoustic roughness. The measured track decay rates shall remain valid during a period starting 1 year before the measurement and ending 1 year after the measurement, provided that during this period no track maintenance has been performed which influences the track decay rates. If beyond the limits of these periods, the same stretch of track is used again for pass-by noise measurements, it is necessary to measure the acoustic roughness or decay rates again. Proof shall be provided in the technical file that the track data related to the type’s pass-by noise measurement were valid during the day(s) of testing, e.g. by providing the date of last maintenance having an impact on noise. If the maximum operational speed of the unit is lower than 80 km/h, the unit shall be tested at this maximum speed, the pass-by noise limits for 80 km/h apply without any correction. Otherwise the pass-by noise of a unit shall be measured at 80 km/h and at v (where v = 190 km/h or the maximum operational speed for which the unit is designed, if this maximum speed is lower than 190 km/h). The value to be compared with the limits (see Table 1) is the maximum of the measured value at 80 km/h and the measured value taken at maximum speed but referred to 80 km/h by the equation LpAeq,Tp (80 km/h) = LpAeq,Tp(v)-30*log (v/80 km/h). Stationary noise shall be described in terms of the A-weighted equivalent continuous sound pressure level LpAeq, T.
Measurements shall be made in accordance with Appendix C.
The limiting value for the stationary noise of freight wagons at a distance of 7,5 m from the centre of the track and 1,2 m above top of rail is given in Table 2. The indicator for the sound pressure level is LpAeq,T. In line with point 2.1.5, OTMs shall be assessed against the requirements for locomotives. Where applicable, the category of locomotive (electric, diesel) of which the requirements shall be used, shall correspond to the traction equipment installed in the OTM. If the OTM is diesel engine powered, it shall correspond to diesel locomotives with P >/= 2 000 kW at the engine output shaft. If the OTM is not equipped with traction equipment, measurement conditions of coach/wagon should be used (no starting noise test) but the limit values for locomotives shall be applied. Noise emitted by locomotives, multiple units and coaches subdivides into stationary noise, starting noise, and pass-by noise. The noise within a driver’s cab is a parameter for units equipped with a driver’s cab. Starting noise is a combination of contributions from traction components such as diesel engines, cooling fans and auxiliaries. The limits for stationary noise are defined at a distance of 7,5 m from the centre of the track, 1,2 m above top of rail. The indicator for the sound pressure level is LpAeq,T. The limiting values for the noise emission of the vehicles under the conditions mentioned are given in Table 3. The specified level for stationary noise is the energy-average of all measured values taken at the measuring points defined in Appendix C.
The limits for starting noise are defined at a distance of 7,5 m from the centre of the track, 1,2 m above top of rail. Measurements shall be made in accordance with Appendix D.
For OTMs the starting procedure shall be performed without additional trailer loads. The indicator for the sound level is LpAFmax. The limiting values for the starting noise of the vehicles under the conditions stated are given in Table 4. The limits for pass-by noise are defined at a distance of 7,5 m from the centre of the track, 1,2 m above top of rail for a vehicle speed of 80 km/h. The indicator for the A weighted equivalent continuous sound level is LpAeq,Tp. The Measured pass-by noise levels shall comply with the values as set out in table 5 when measured on track complying with Appendix A. It is permitted to carry out the test on track that does not comply with Appendix A and if the noise levels do not exceed the values shown in table 5, there is a presumption of conformity to this requirement. An entry shall be recorded in the technical file and in the ERATV if the measured values are ‘comparable’ or ‘non-comparable’. 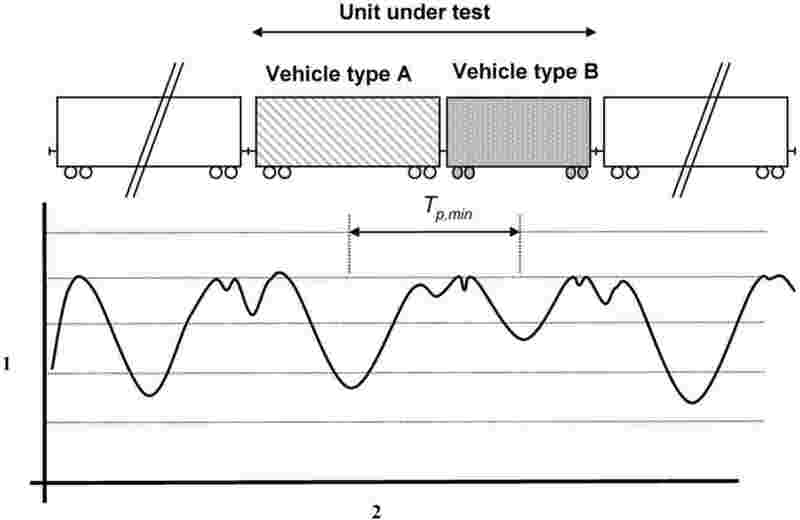 Measured values of noise as well as corresponding track quality shall always be saved in the technical file for later evaluation of correspondence between vehicle and track noise for both comparable and non-comparable data. If the maximum operational speed of the unit is lower than 80 km/h, the unit shall be tested at this maximum speed, the pass-by noise limits for 80 km/h apply without any correction. Otherwise the pass-by noise of a unit shall be measured at 80 km/h and at v (where v = 190 km/h, or the maximum operational speed for which the unit is designed, if this maximum speed is lower than 190 km/h). The value to be compared with the limits (see Table 5) is the greater of the measured value at 80 km/h and the measured value taken at maximum speed but normalised to 80 km/h by the equation. The limiting values for the noise emission of electric and diesel locomotives, EMUs, DMUs and coaches under the conditions stated above are given in Table 5. For OTMs the measuring procedure shall be performed without additional trailer loads. OTMs which are solely braked by either composite brake blocks or disc brakes, are deemed to comply with the pass-by noise level requirements in table 5 without measuring. This applies also if these vehicles are equipped with composite scrubbers. As addressed in point 2.1.5, OTMs shall be assessed against the requirements for locomotives. The interior noise level of passenger vehicles is not considered to be a basic parameter. However, the noise level within the driver’s cab is an important issue. Noise levels in the cab must be kept as low as possible, by limiting the noise at the source and by appropriate additional measures (acoustic insulation, sound absorption). The limiting values are defined in Table 6. For OTMs the measuring procedure shall be performed without additional trailer loads. Measurements shall be made in accordance with Appendix F.
This table applies to drivers’ cabs. In any event, Directive 2003/10/EC of the European Parliament and of the Council of 6 February 2003 on the minimum health and safety requirements regarding the exposure of workers to the risks arising from physical agents (noise) (1) on has to be applied by railway undertakings and their staff, but the compliance with Directive 2003/10/EC does not concern the EC verification of rolling stock with drivers’ cabs. This TSI is part of the framework of TSIs which set requirements to the CR rolling stock subsystem. In light of the essential requirements in Section 3, there are no operating rules specific to the subsystem rolling stock regarding noise emitted by rolling stock. See maintenance file, which is specified in the conventional rail rolling stock TSIs. generally, as regards average values, for standard operational conditions. interior noise in the driver’s cab. At the request of the applicant, a notified body shall carry out the EC verification in accordance with Annex VI to Directive 2008/57/EC, and in accordance with the provisions of the relevant modules. The applicant shall draw up the EC declaration of verification for the rolling stock subsystem including the noise aspect in accordance with Article 18(1) and Annex V to Directive 2008/57/EC. The module SD is permitted only to be chosen where the applicant operates a quality management system for production, final product inspection and testing, approved and surveyed by a notified body of their choice. The module SH1 is permitted only to be chosen where the applicant operates a quality management system for design, production and final testing, approved and surveyed by a notified body of their choice. Notwithstanding the exemptions as described in this section, by default all new types need to be assessed in compliance with the requirements specified in Section 4 of this TSI. Instead of the test procedures as set out in Section 4 of this TSI, it may be permitted to substitute some or all of the tests by a simplified evaluation method. The eligibility criteria and requirements associated to the simplified evaluation method are set out in this section. 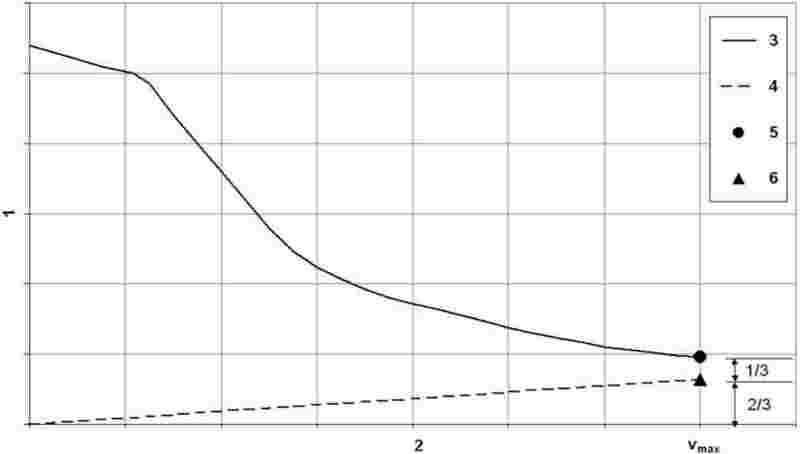 The simplified evaluation method consists of acoustically comparing the type under assessment to an existing type with documented noise characteristics compliant with the noise TSI; the latter is further referred to as the reference type. in compliance with Section 4 of the TSI CR ‘rolling stock— noise’ adopted by Decision 2006/66/EC. New units which are largely based on an existing design (same vehicle family). 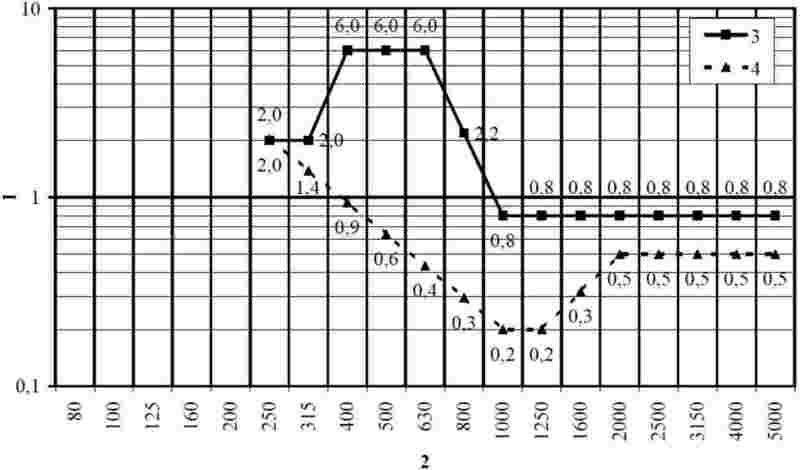 For the units under assessment for simplified evaluation, the proof of conformity shall include a detailed description of the noise relevant changes compared to the reference type. From this description, a simplified evaluation (see points 6.2.3.2 and 6.2.3.3) shall be performed to identify the differences in terms of expected noise emission, of the noise cases specified in point 4.2 between the reference unit and the unit under assessment. The simplified evaluation may be used on a unit for each of the individual noise cases autonomously: stationary noise, starting noise, cab-noise and pass-by noise. The simplified evaluation shall prove that the unit under assessment complies with the applicable noise levels as set out in this TSI, for those noise cases for which the simplified evaluation is used. The simplified evaluation on a unit shall consist of providing evidence to show that the acoustically relevant systems and characteristics are either identical to those of the reference type, or such that they will not result in higher noise emission of the unit under assessment. The simplified evaluation can either be a calculation, or simplified measurement (e.g. sound power of noise sources), or a combination of both. Noise relevant systems which differ from the reference type shall be identified in the technical file. For upgraded or renewed wagons, also see point 7.6.1. In case additional conformity assessment is needed and where table 7 is complied with, the simplified evaluation method is permitted to be used for upgraded or renewed freight wagons. For new wagons: in cases where table 7 is complied with, the simplified evaluation method is permitted to be used for freight wagons. The pass-by noise levels as set out in point 4.2.1.1 are deemed to be compliant without testing. For stationary noise, the simplified evaluation shall consists of providing evidence to show that the acoustically relevant systems and characteristics are either identical to those of the reference type, or such that they will not result in higher noise emission of the unit under assessment. The simplified evaluation can either be a calculation, or simplified measurement (e.g. sound power of noise sources), or a combination of both. Noise relevant systems which differ from the reference type shall be identified in the technical file. When a unit is positively assessed against the HS RST TSI, it is deemed to comply with the requirements in this TSI without further checks. In this case, the applicant may issue its EC declaration without further evaluation. This is only permitted if there are no derogations relating to noise aspects. In conformity with Article 6(2) of Directive 2008/57/EC, the Agency shall be responsible for preparing the review and updating of TSIs and making appropriate recommendations to the Commission in order to take account of developments in technology or social requirements. In addition, the progressive adoption and revision of other TSIs may also impact this TSI. Proposed changes to this TSI shall be subject to rigorous review and updated TSIs will be published on an indicative periodic basis of 3 years. It is recommended that in the case of new rolling stock to be ordered after 23 June 2016, or authorised to be placed into service after 23 June 2018, points 4.2.1.1 and 4.2.2.4 of this TSI are applied with a reduction of 5 dB except for DMUs and EMUs. For both latter cases the reduction is 2 dB. This recommendation will serve only as a basis for revising points 4.2.1.1 and 4.2.2.4 in the context of the TSI revision process mentioned in point 7.2. The specifications provided by this TSI apply to all new rolling stock within the scope of this TSI. The starting noise limits may be raised by 2 dB for all DMUs, with an engine power greater than 500 kW/engine, authorised to be placed into service by 23 June 2011 at the latest. Where notified agreements contain requirements related to noise, these agreements remain permitted until the necessary measures are taken including EU level agreements related to this TSI with the Russian Federation and all the other CIS countries having a border with the EU. Any future agreement or modification of existing agreements shall take into account EU legislation and, in particular, this TSI. Member States shall notify the Commission with such agreements/modifications. In the case of renewal or upgrading of freight wagons, the Member State concerned has to decide, in accordance with Article 20 of Directive 2008/57/EC, if a new authorisation for placing into service is needed. If the performance of the brake system of this wagon is changed by the renewal or upgrading and if a new authorisation of placing into service is needed, the requirement is that the pass-by level of this wagon shall comply with the relevant level indicated in Table 1 of point 4.2.1.1. If a wagon during renewal or upgrading is being equipped (or is already equipped) with composite blocks and without adding additional noise sources to the wagon, it shall be assumed without testing that the values of point 4.2.1.1 are fulfilled. An upgrading for noise emission reduction only is not mandatory, but if upgrading is done for another reason it shall be demonstrated that renewal or upgrading does either not increase pass-by noise levels, or when increased remain within the limits which are specified in this TSI. For stationary noise, it shall be demonstrated that the stationary noise levels do either not increase, or when increased remain within the limits which are specified in this TSI. As an alternative to full vehicle measurement, the demonstration of compliance of a unit is permitted to be performed by an evaluation under the conditions as defined in point 6.2.3 of this TSI. In this case the unit before upgrade shall act as the reference unit. It shall be demonstrated that the noise levels of renewed or upgraded units are either not increased, or when increased remain within the limits which are specified in this TSI. The demonstration of compliance of a unit can, as an alternative to full vehicle measurement, also be done by an evaluation under the conditions as defined in point 6.2.3 of this TSI. In this case the unit before upgrade acts as the reference unit. The following special provisions shall apply in the specific cases referred to in this point. Specific cases belong to two categories: the provisions apply either permanently (case P), or temporarily (case T). In temporary cases, it is recommended that the Member States concerned should conform with the relevant subsystem either by 2010 (case T1), an objective set out in Decision No 1692/96/EC of the European Parliament and of the Council of 23 July 1996 on Community guidelines for the development of the trans-European transport network (3), or by 2020 (case T2). The application of national technical rules instead of the requirements in this TSI is permitted for third countries’ rolling stock to be used on the Finnish 1524 network in traffic between Finland and third countries 1520 network. In the territory of Finland, the limits for stationary noise in point 4.2.1.2 shall not be applied to wagons equipped with a diesel aggregate for electrical power supply higher than 100 kW when the aggregate is used. In this case the stationary noise limit may be raised by 7 dB due to the temperature range down to — 40 °C together with freezing and icy conditions. The noise emission limits for freight wagons are not valid for Finland, Estonia, Latvia and Lithuania. The reason for this is the safety aspects under Nordic winter conditions. This specific case is valid until the functional specification and assessment method for composite brake blocks are incorporated in the revised version of the WAG TSI. For the existing isolated 1 000 mm gauge, national rules shall apply. (1) OJ L 42, 15.2.2003, p. 38. The condition of the rail acoustic roughness shall be considered suitable for comparable measurements if the one-third octave band roughness spectra assessed according to EN15610 throughout the test section fulfil the following upper limit taking into account, if necessary, the flexibility process described in Appendix B. The wavelength bandwidth should be at least 0,003 m to 0,10 m (0,3 cm to 10,0 cm corresponding to Figure 1). 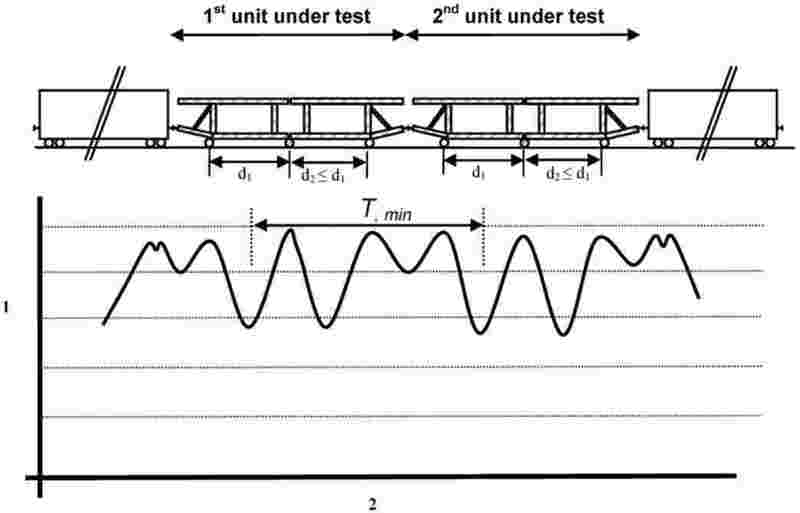 The ‘small deviations’ method aims at introducing some flexibility in the conformity assessment of a test track section towards a limit curve of acoustic rail roughness within the frame of constant speed tests. Both the limit curve and the measured acoustic rail roughness spectra are assumed to be one-third octave band wavelength spectra. 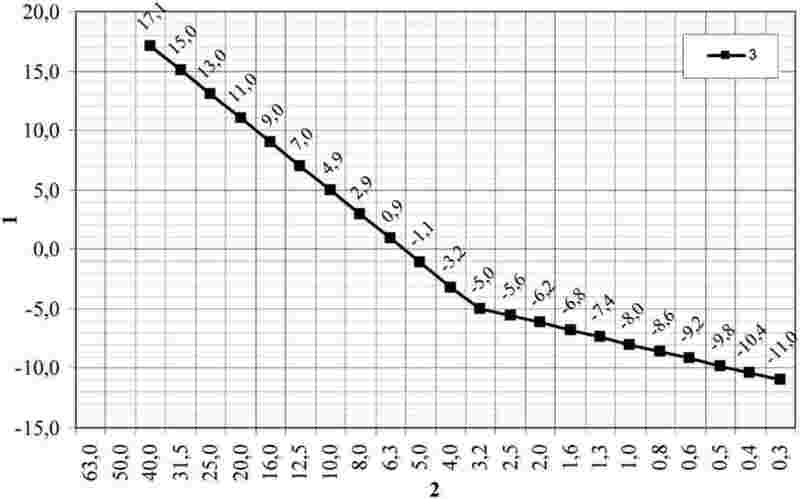 Deviations to the track decay rates are not acceptable under the Small deviation calculation method. The method relies on a calculation of a correction to the measured level based on the effect of any exceeding of a specified spectrum of acoustic rail roughness. The difference between the corrected pass-by noise level and the measured one is then compared to an acceptance criterion. If the criterion is fulfilled, the acoustic impact of the rail roughness deviations is deemed ‘small’ and the measured pass-by noise level is considered to be comparable. This method is train speed dependent. NOTE 1 The corrected acoustic rail roughness spectrum is equivalent to the measured one except in the wavelength bands where the measured spectrum exceeds the limits. First derive frequencies from wavelengths using the formula f = v/λ where λ is the wavelength and f is the corresponding frequency at train speed v. This leads to a non-normalized one-third octave frequency roughness spectrum. is the one-third octave frequency correcting spectrum. The revised noise spectrum is derived from a simplified process. This procedure shall not be used as a prediction method to correct noise levels. NOTE Since it has been assumed, in the method of calculation, that the rail roughness exceeding directly applies to the total noise, the revised noise spectrum is the minimum that might have been measured with the just compliant roughness spectrum. where stands for the dB sum of all the one-third octave frequency bands i. 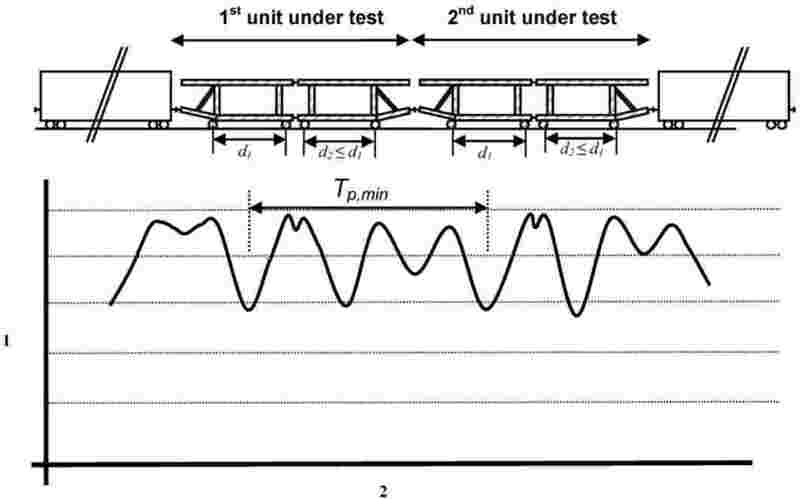 The track shall be considered to be compliant regarding the acoustic rail roughness spectrum if the noise impact ΔLpAeq,Tp calculated according to step 3 is less than or equal to 1 dB. This compliance shall be examined for one pass-by at each speed. The measurements shall be carried out only if noise sources are present at standstill with the operating conditions specified under the heading ‘Vehicle conditions’ in this annex. Additionally, an area around the microphones having a radius which is at least 3 times the measurement distance shall be free of large reflecting objects like barriers, hills, rocks, bridges or buildings. Care shall be taken to ensure that the noise from other sources (for example other vehicles or industrial plants and due to wind) does not influence significantly the measurements. The maximum value of the LAeq,T T = 20s of background noise over all microphone positions shall be at least 10 dB below the final result (energy-mean of all the measuring positions, see under heading ‘Measurement mesh’ in this annex) obtained when measuring the noise from the unit in the presence of background noise. The measurements shall be made on track with ballast bed. Air management systems, including grilles, filters and fans, shall be clear of any obstruction. During the measurements, the doors and windows of the unit shall be kept closed. All equipment that operates continuously when the unit is stationary shall be operating at normal load, which is the performance at an external temperature of 20 °C. For HVAC systems conditioning passenger areas and working places as well as system supplying energy for this function, climate influence parameters shall be set at: wind speed at 3 m/s, relative humidity at 50 %, 700W/m2 energy from sun radiation, one person per seat and a constant interior temperature of 20 °C. Traction equipment shall be in a stationary thermal condition with cooling equipment working at minimum condition. For units with internal combustion engines, the engine shall idle. Each vehicle (a multiple unit comprises a number of vehicles) shall be divided into equally distributed areas, each having an identical horizontal length lx of between 3 m and 5 m. The length of the vehicle is the distance between couplers or buffers. Each measurement position is located at midlength along the relevant area on both sides of the vehicle. Extra measurement positions shall be taken at the front and rear end of the unit: two microphones located at 60 ° from the centre of the track, on a half circle having its centre in the midpoint of the unit end (without couplers or buffers) and a radius equal to 7,5 m as illustrated in Figure 3. In the case of a trailer unit these extra positions shall be measured only at ends which are equipped with a cab. Each measurement position shall be located at a distance of 7,5 m from the centre line of the track at a height of 1,2 m above top of rail and opposite the centre of the unit. The microphone axis shall be horizontal and directed perpendicularly to the contour of the unit. If both sides of the unit are identical (axisymmetric or point symmetric) then it is permissible to omit the measurement points on one side of the unit. If several vehicles of the same type are present within a multiple unit or a fixed formation train, it is permissible to measure each type of vehicle once. The reduction of the number of measurement positions shall be justified in the report. Omitted points shall be listed and their assumed equivalent location identified. The measured acoustic quantity is L pAeq,T, with T = 20s. The unit shall be stationary. The measurement time interval T shall be at least 20 s. If, however, as an exception it is not possible to maintain the source of noise at its nominal load for 20 s, the measurement time interval T may be reduced to a minimum of 5 s. This reduction shall be specified and justified in the test report. n is the number of measurement positions. The n measurement positions used in the summation shall correspond to the whole mesh defined under heading ‘Measurement mesh’ in this annex, before any possible reduction (see under heading ‘Reduction of the number of measurement positions’ in this annex). Where appropriate the noise levels of measured equivalent points shall be assigned to omitted points. A shall then be produced for each of the three sets of measurements. The test result shall be the arithmetic mean of the values, rounded to the nearest integer decibel. The individual as well as the mean shall be presented in the report. In addition, the full set of measured at all measurement positions shall be presented in the report. Additionally, an area around the microphones having a radius which is at least 3 times the measurement distance on both sides shall be free of large reflecting objects like barriers, hills, rocks, bridges or buildings. The maximum value of the L Aeq,T T = 20s of background noise over all microphone positions shall be at least 10 dB below the L pAFmax obtained when measuring the noise from the unit in the presence of background noise. The track at the measuring section shall be laid without rail joints (welded rail) and free of visible surface defects such as rail burns or pits and spikes caused by the compression of external material between wheel and rail: no audible impact noise due to welds or loose sleepers should be present. All equipment that operates continuously when the unit is starting shall be operating at normal load, which is the performance at an external temperature of 20 °C. For HVAC systems conditioning passenger areas and working places as well as system supplying energy for this function, climate influence parameters shall be set at: wind speed at 3 m/s, relative humidity at 50 %, 700W/m2 energy from sun radiation, one person per seat and a constant interior temperature of 20 °C. If the noise of an item of auxiliary equipment contributes significantly to the result and is not repeatable, it shall not be considered part of this measurement. Any part of a measurement that is excluded shall be identified in an LAF(t) plot. Tests shall be performed with maximum tractive effort without wheel spin and without macro slip. If the train under test does not comprise a fixed formation, the hauled load has to be defined and shall be sufficient to ensure that the maximum tractive effort will be developed during the measurement. When applicable the traction unit shall be at the head of the train. For standard acceleration tests the measurement positions shall be located at 7,5 m distance from the centre of the track at 1,2 m height. One measurement position shall be located at the front measurement cross section, which is defined as being 10 m ahead the front of the unit. For units longer than 50 m at least one position at 10 m ahead the centre of the unit shall be used. If the distance between the two measurement positions is greater than 50 m then additional measurement positions are required. The distance D between adjacent measurement positions shall be constant and no greater than 50 m.
Measurement shall be carried out on both sides of the unit. If both sides of the unit are identical (axisymmetric or point symmetric) then it is permissible to omit the measurement points on one side of the unit. The measured acoustic quantity is L pAF(t). The train shall accelerate from standstill up to 30 km/h and then maintain the speed. The measurement time interval T shall begin when the unit under test starts to move and shall end when it is 10 m past the front measurement cross section. Determine the L pAFmax for each measurement (for each starting event and each measurement position). Calculate the arithmetic average of the three valid measurements at each measurement position, rounded to the nearest integer decibel. The maximum value of the LAeq,T T = 20s of background noise over all microphone positions shall be at least 10 dB below the LpAeq,Tp obtained when measuring the noise from the unit in the presence of background noise. For frequency analysis (only necessary in case the small deviation process is used) this difference shall be at least 10 dB in each frequency band of interest. The track on which the measurements are performed shall have a consistent superstructure over a minimum length of twice the microphone distance to either side. This includes geometry of the line, track quality, rail roughness and track decay rates as described in this TSI. r ≥ 5 000 m for tests at train speeds v > 120 km/h. Where powered units are tested, the level gradient at the track shall be 5:1 000 at the most. The standard superstructure for the constant speed test is a track with ballast bed and wooden or reinforced concrete sleepers without any type of rail or track shielding (use of rail dampers is accepted to comply with track decay rate limits in this TSI). There shall be no ice, frost, or other frozen water products on the test track. The temperature during measurements is permitted to be below zero degrees Celsius. The track at the measuring section shall be laid without rail joints (welded rail) and be free of visible surface defects such as rail burns or pits and spikes caused by the compression of external material between wheel and rail: no audible impact noise due to welds or loose sleepers shall be present. 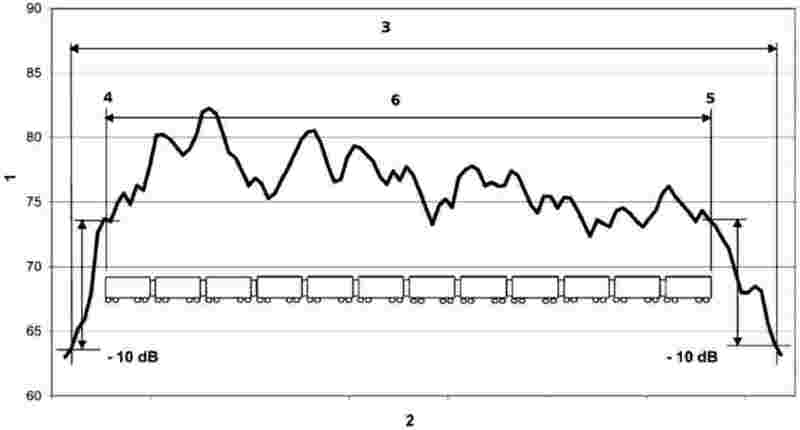 The normal operating conditions for stationary noise measurements apply, as defined in annex C of this TSI. Additionally, for fixed formation units, a minimum tractive effort to maintain a constant speed shall be applied during the pass-by noise measurement. To ensure a steady operating condition, it might be required to operate the unit already a certain time in advance in this operating condition. Except for locomotives, during the pass-by noise measurements, units shall not be physically loaded beyond what is specified above, e.g. no goods shall be loaded to wagons and no passengers shall be present in passenger units. If the unit being tested is a locomotive, the hauled load shall be at least two-thirds of the maximum permissible value. 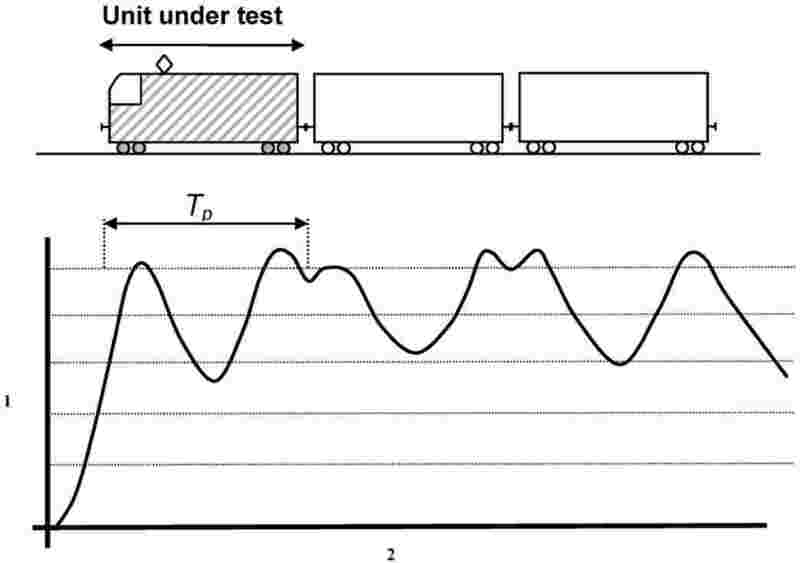 For the purposes of this standard, it is permissible to use the maximum tractive effort that can be generated at maximum speed as a proxy for maximum permissible hauled load (see Figure 5). Where appropriate meters and displays are available within the cab of the locomotive under test, the required testing condition may be ensured by operating the locomotive with an indicated tractive effort of at least two-thirds of the maximum available tractive effort. This condition is permitted to be ensured by including an instrumented brake vehicle within the hauled set of vehicles, thus allowing the tractive effort to be controlled precisely during the test period by brake application. The test report shall describe the state of the traction equipments during the test. The unit shall be in its normal operating conditions and, for test with constant speed, its wheels shall have run in normal traffic at least 1 000 km on track with normal traffic. The wheel treads shall be as free as possible from irregularities, such as flats. For units with tread brakes or scrubber (tread cleaning brakes) the block/tread pair shall be in a run-in condition where block and tread have bedded in sufficiently. Before starting the pass by measurements (typically just before starting the measurements, but not more than 24h before starting the measurements) such units shall be braked to standstill two times. Braking shall start at 80 km/h or at the maximum unit speed in the case where it is lower than 80 km/h. The unit shall be braked until a complete stop with a deceleration which is typical in normal operation, but which ensures that no wheel flats are generated. Noise from other parts of the train shall not influence the measurements of the unit(s) under test. Therefore, for the measurement of a trailed unit, there shall be an acoustically neutral vehicle on one side of at least two units under test, and no vehicle or an acoustically neutral vehicle on the other side. For the measurement of locomotives the adjacent vehicle shall be acoustically neutral. the LpAeq,Tp1 is no more than 2.0 dB greater than LpAeq,Tp where the passing times Tp1 and Tp are indicated in Figure 6 (for this evaluation round values to one decimal place). This condition shall be verified and documented at least once for each tested speed. The measurement position shall be located at a distance of 7,5 m from the centre line of the track at a height of 1,2 m above top of rail. The basic measured acoustic quantities are L pAeq,Tp , train speed and pass-by time Tp . If required due to the use of the small deviations method as described in annex B of TSI, the frequency spectrum also needs to be determined. A series of at least three measurements shall be made at each measurement position and for each measurement condition (one vehicle condition at one speed). The validity of the measurements shall be assessed against the background noise level (see under heading ‘Background sound pressure level’ in this annex) as well as the acceptable spread of the measurement samples (Where a series of three measurement samples are required, a spread of less than or equal to 3 dB shall be fulfilled for the measurement to be considered as valid. Otherwise, additional measurements shall be made.). The speeds of testing are set out in points 4.2.1.1 and 4.2.2.4 of this TSI. Over the measurement section of the track, the unit under test shall be run at the chosen speeds stabilised within ± 5 %. The speed shall be measured by a device with an accuracy better than 3 %. The speedometer of the train is permitted to be used, provided a calibration with accuracy better than 3 % is performed. Irrespective of the type of rolling stock being measured, the recording time interval Trec shall be chosen, so the record starts when the A-weighted sound pressure level is at least 10 dB lower than found when the front of the train is opposite the microphone position. 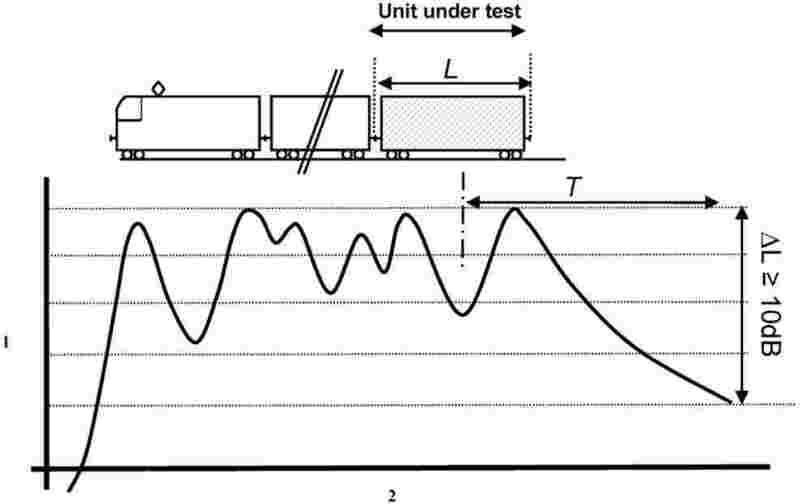 The record shall not end before the A-weighted sound pressure level is 10 dB lower than found when the rear of the train is opposite the microphone position (see Figure 7). For multiple units or fixed train formations, the measurement time interval T shall coincide with the pass-by time Tp of the whole unit past the measuring point. Locomotives or driving trailers shall always be tested at the head of a test train. The measurement time interval T shall coincide with the pass-by time Tp of the whole unit (over buffers) past the measuring point (see Figure 8). For trailed unit(s) which form part of a train, the measurement time interval T shall start when the centre of the first unit passes the measurement position (T1 ) and ends when the centre of the last unit passes the measurement position (T2 ). This procedure is only applicable where at least two units of the type under test are available. The following point on ‘Measurement time intervals – Special cases’ provides acceptable test procedures for the described special cases of trailer units. When measuring a unit within a train, the unit shall be located using an independent device, such as an optical trigger or a wheel detector. Figure 9 shows the minimum measurement time interval Tmin required for the measurement of a trailer unit. Only when the general assessment requirements as described in point E6.2.2 of this Appendix cannot be applied due to either the physical configuration of the unit under assessment is incompatible, or the unit is a one-off unit, it is permitted to use the special assessment method following the general rules as described under the heading ‘General rules’ in this annex. The clauses as set out after the ‘general rules’ define the application of the general rules to specific types of units. In any case adjacent vehicle(s) shall be acoustically neutral and therefore fulfil the conditions specified in section ‘Train composition (adjacent vehicles)’ of this annex. The measurement time interval chosen shall allow the assessment of the whole acoustic signature of the unit under test. Therefore the minimum measurement time interval Tmin shall correspond to the pass-by time (or a multiple of it) of this unit past the measurement position. The measurement time interval shall begin when the centre of the longest segment between two consecutive wheelsets passes the microphone and ends after the same position of the last unit under test passes the microphone. In some configurations, the wheelsets are located close to or directly at the centre of the unit under test. In such a case, the minimum measurement time interval Tmin shall not begin when the centre of the first unit under test but when the centre of the longest segment between two consecutive wheelsets of this unit passes the measurement position. It ends after the equivalent location on the last unit passes the measurement position (see examples in Figure A.10 and Figure A.11). Where the unit under test is composed of two permanently coupled vehicles, not necessarily identical, it is permissible to measure only one unit, provided that both vehicles are point symmetric. In such a case, T1 corresponds to the passing of the centre of the first vehicle and T2 corresponds to the passing of the centre of the last vehicle of the unit. NOTE It is recommended to test such a unit at the end of the test train. When a series consists of one unit, it is permissible to measure this single unit provided that it is acoustically point symmetric. This procedure does not apply to driving trailers. The unit under test shall be positioned at the end of the train. The measurement time interval T shall begin when the centre of the unit passes the measurement position and ends when the noise level measured at the measurement position has decreased by at least 10 dB compared to the maximum noise level measured during pass-by of the unit (see Figure A.13). The value of L pAeq,Tp shall be calculated for each measurement position. The test result shall be the arithmetic mean value of each series of measurements, rounded to the nearest integer decibel. Where a normalisation of the pass-by noise to a reference speed is required, then this shall be performed before rounding. If the sound pressure levels measured on each side of the unit are different; the higher sound pressure level shall be retained as final test results. When spectra are required due to the use of the ‘small deviations’ method, they should be supplied in one-third octave bands in the range of at least [31,5 Hz – 8 000 Hz]. For the measurements at maximum speed, the microphone shall be positioned at the level of the driver’s ear (in the seated position), at the centre of a horizontal plane extending from the front window panes to the rear wall of the cab. For the measurements of the horn’s impact, eight evenly spaced microphone positions around the position of the driver’s head with a radius of 25 +/–2,5 cm (in the seated position) shall be used, in a horizontal plane. The arithmetic mean of the eight values shall be assessed against the limit. the reference sound pressure; p 0 = 20 μPa. All measurement distances mentioned in the standard shall be considered with a tolerance of ± 0,2 m if no requirement is specified.